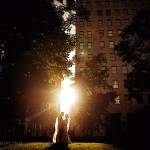 I saw something at the Rockleigh wedding that I had never seen before. While this was not the first wedding I have shot where the bride had a twin sister, it’s the first time that both the bride and her sister were both engaged! Not only that, they were both going to wear the same wedding dress. Both girls loved the same dress, so they decided to share. 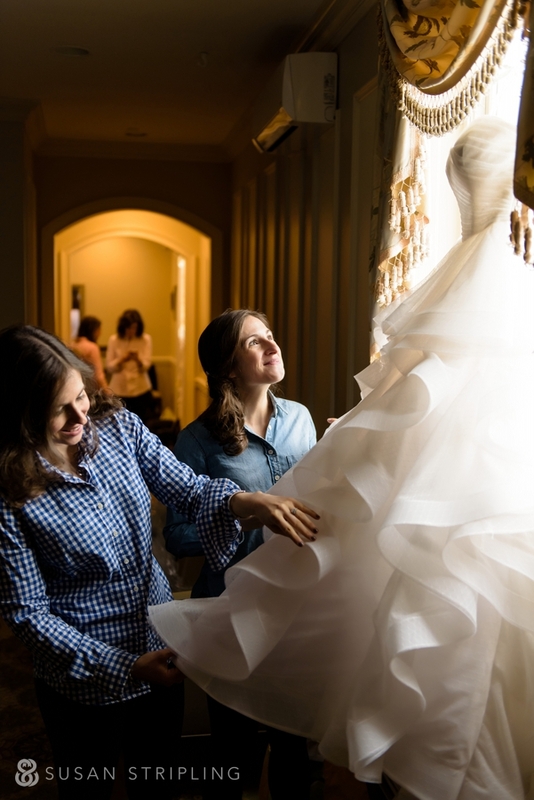 My client was the first to wear the beloved Judd Waddell gown, so we had to take great care of it all day! Not only is the dress still in brilliant condition, it’s well-loved and well-worn, ready for it’s next wedding next year! 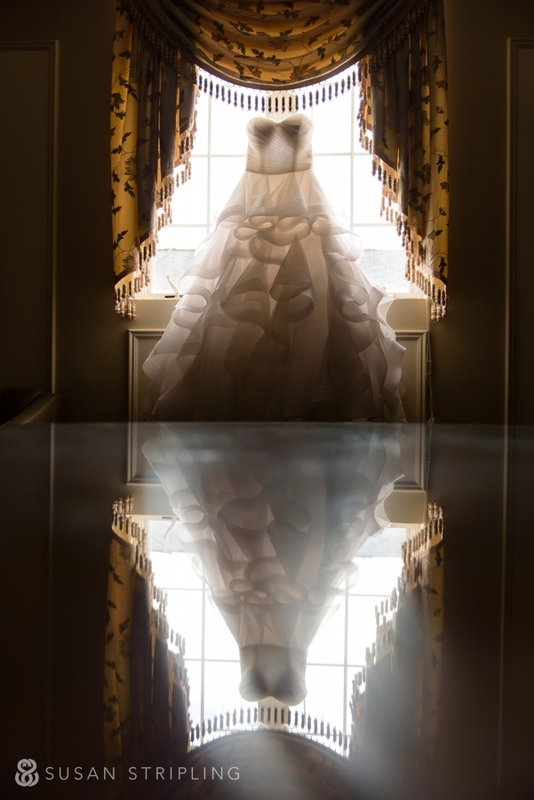 We started the day in the bridal suite at The Rockleigh. I love the light in this room. It’s great for getting ready images! After seeing the Judd Waddell dress in person, I can understand why both sisters loved it so. It was delicate and dramatic at the same time, and suited the women perfectly. 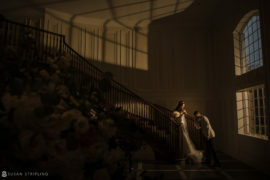 Before the bride got dressed, I had a few moments alone with her details. 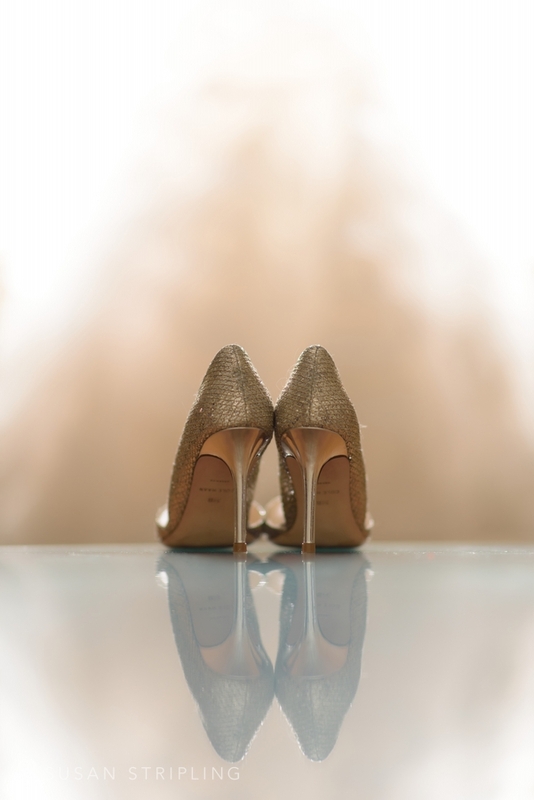 I love this shot of her shoes with the wedding dress hanging in the window, creating a lovely, indistinct, watercolor background. 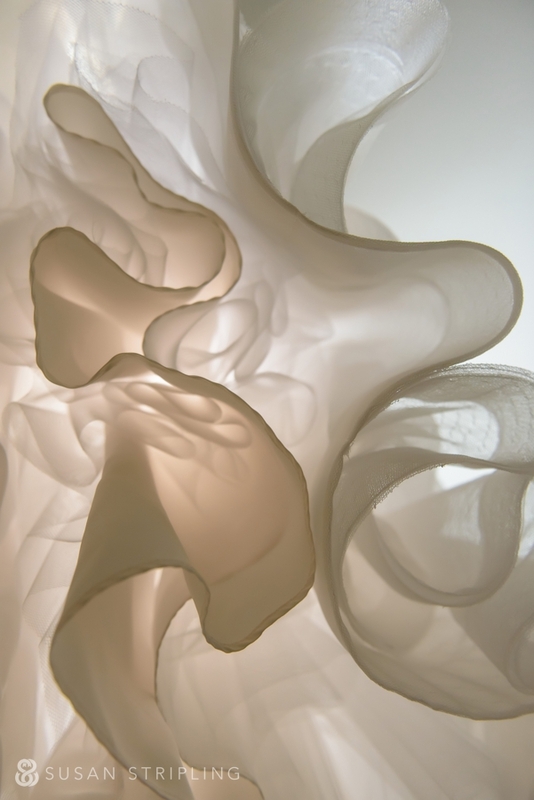 Every whorl and piece of lace was perfectly placed. I was pretty in love with the dress myself! The bride and her family are so sweet to each other. 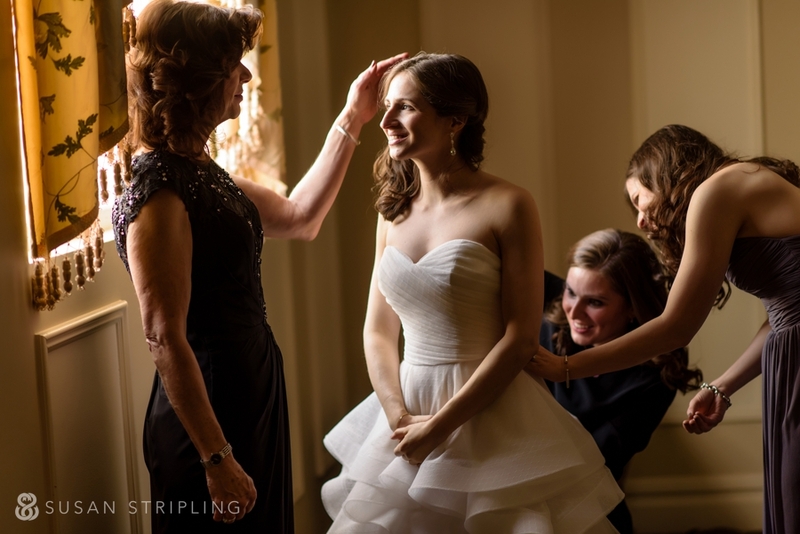 I love this wonderful moment between the bride and her mother. I love that you can also see her sister in the background, helping with the zipper of the dress. Such sweet moments, such a sweet family. 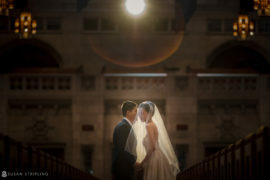 The bride and groom are amazing with each other. This is totally an unscripted moment! 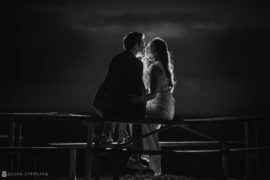 I had a few moments alone with the bride to create some simple bridal portraits. I love these windows at The Rockleigh! The bride was surrounded by some truly wonderful, dynamic women. 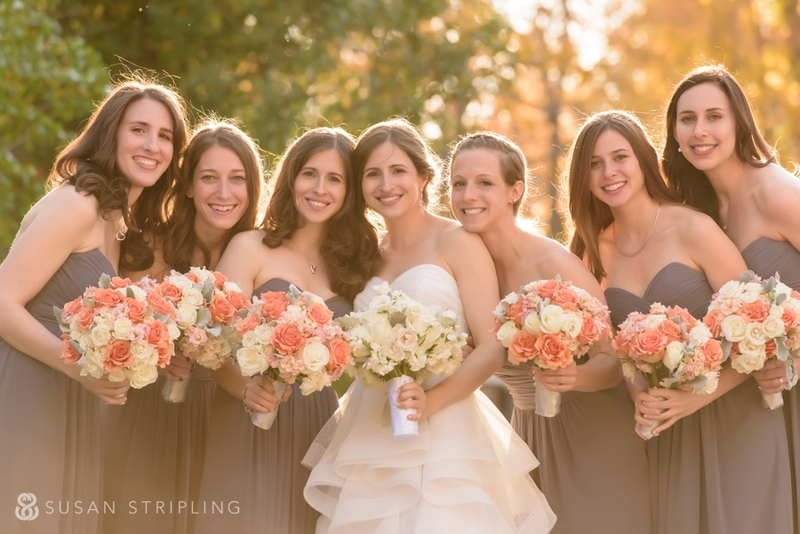 I love the bridesmaids’ dresses, and the gorgeous bouquets by Amaryllis Event Decor. 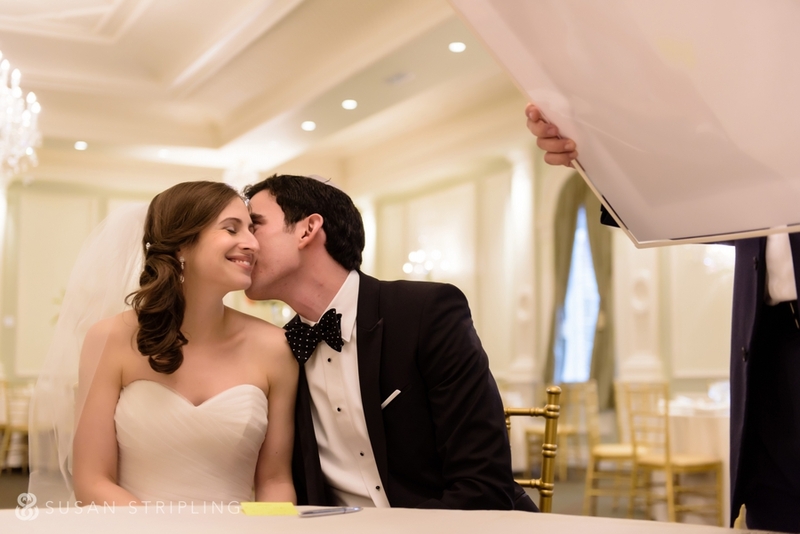 Immediately before the wedding ceremony, the bride and groom signed their ketubah. Although they were surrounded by family and friends, I love this moment because it illustrates how private the moment was. 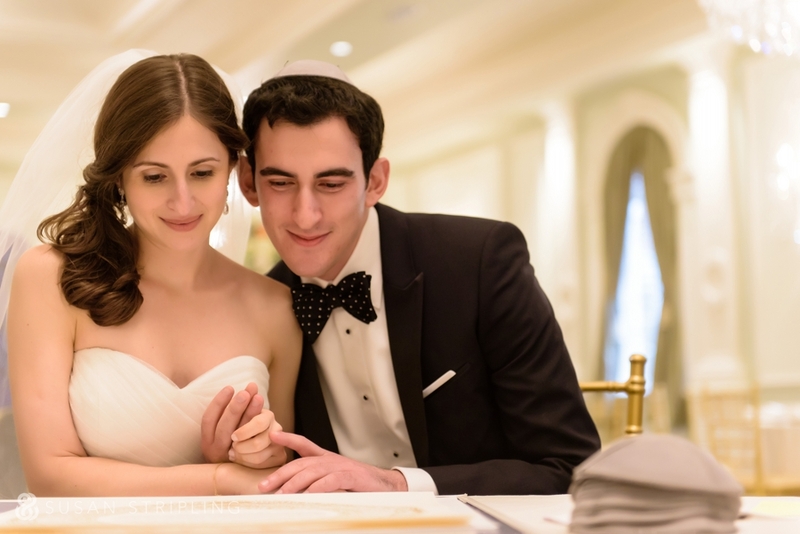 The signing of the ketubah, and the beautiful traditional moments therein, are among my favorite times during a Jewish wedding ceremony. Josh is so kind to his bride. He’s a great guy, sweet and funny and fun. It was a joy to watch him interact with his wife! 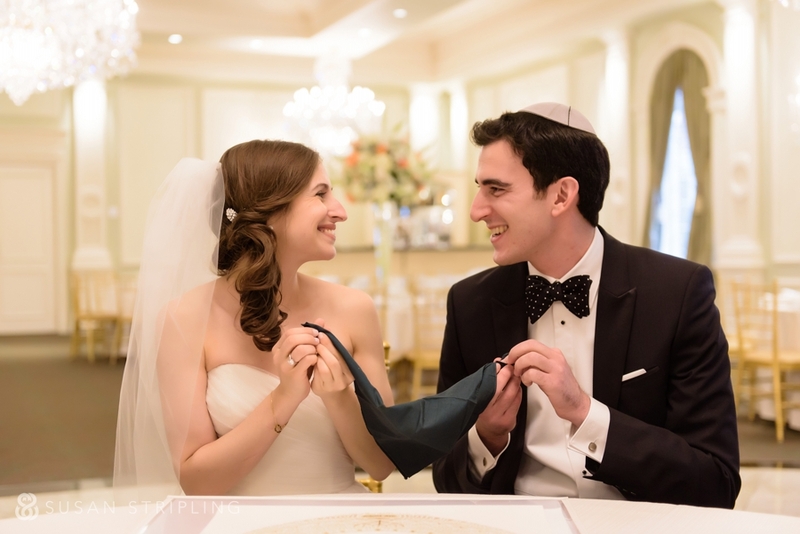 The veiling of the bride is the last thing to happen before heading to a Jewish wedding ceremony. 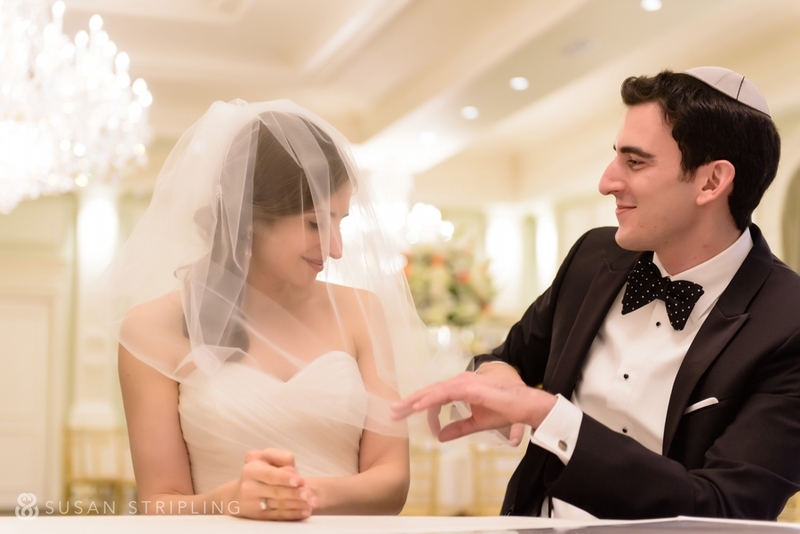 I love both of their facial expressions, and how gently he’s handling her delicate veil! 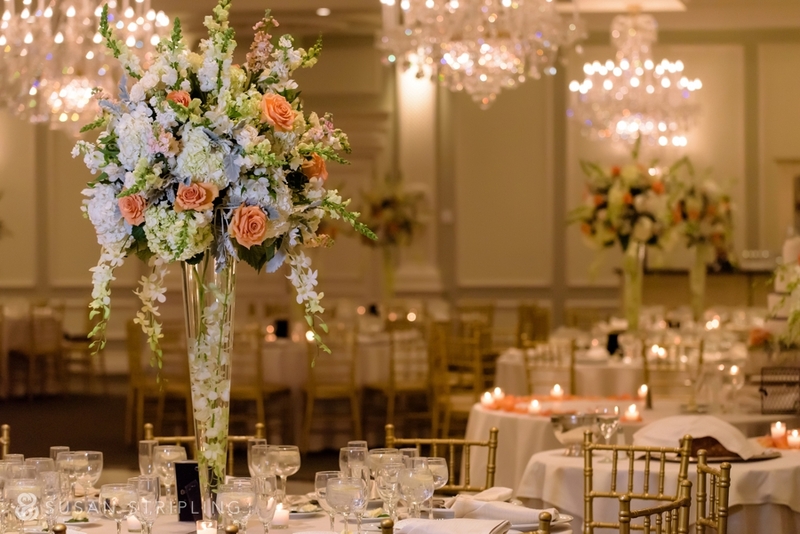 The wedding ceremony was held indoors at the Rockleigh. 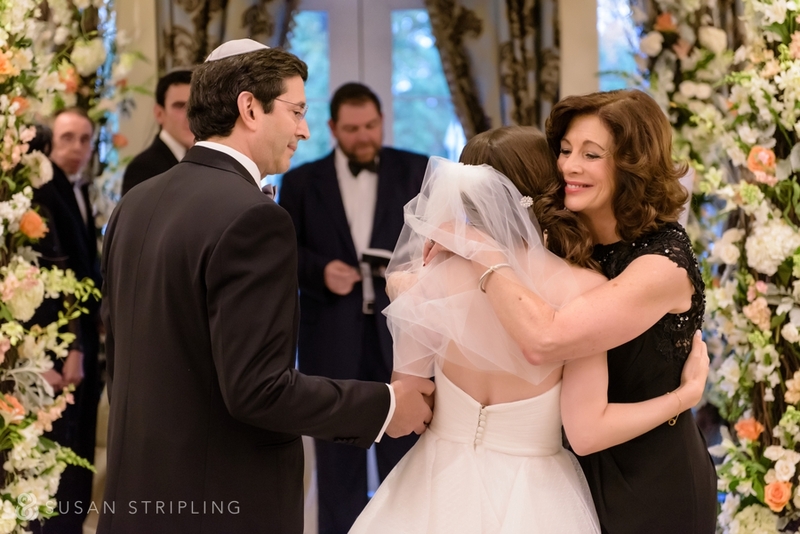 I love this moment between the bride her mom! 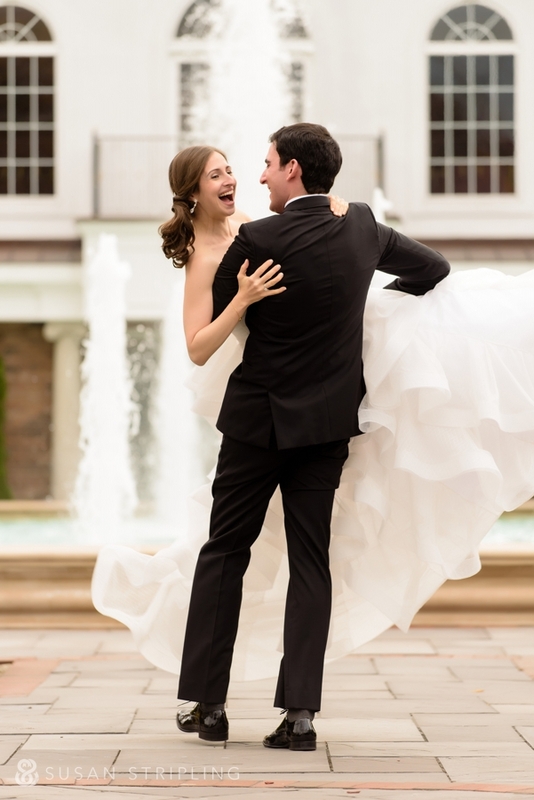 This was right after she walked down the aisle, and right before she circled her new husband seven times. The traditions are so beautiful, and so very meaningful. 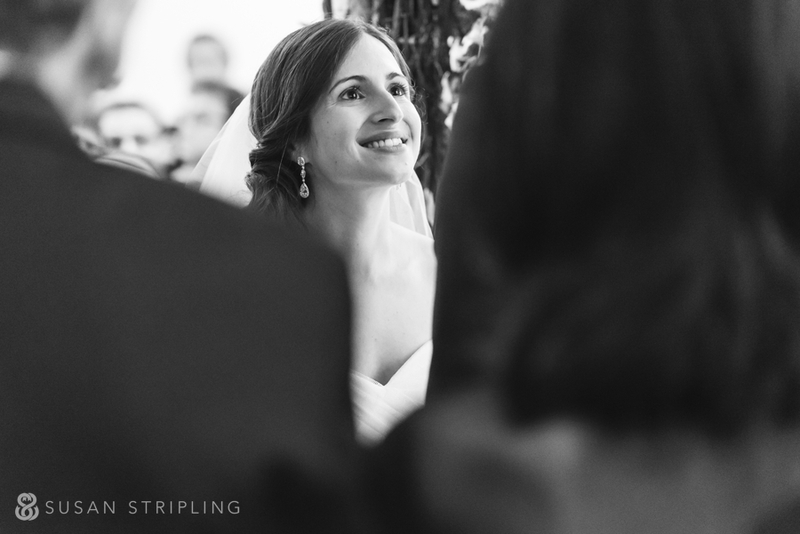 I do my best to find different angles during a wedding ceremony – without being distracting to the guests! 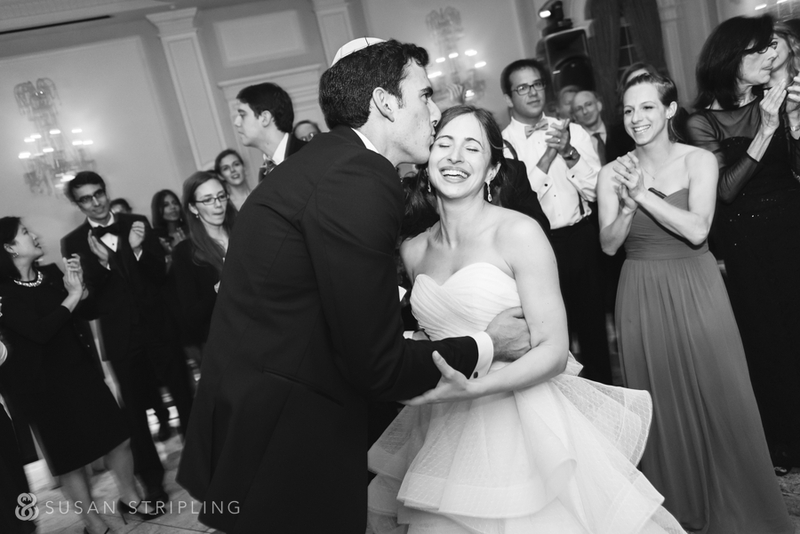 I am so glad there was room to move around, because the bride’s facial expressions were so lovely. After the ceremony, the guests moved to cocktail hour. I went into the ballroom for a few quick images of the reception decor before documenting cocktail hour. 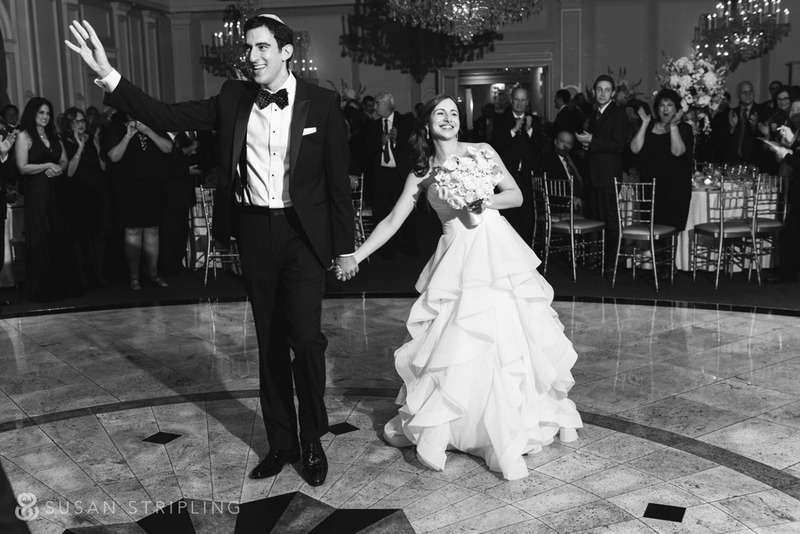 After the wedding party was announced, the bride and groom entered the ballroom to a standing ovation. 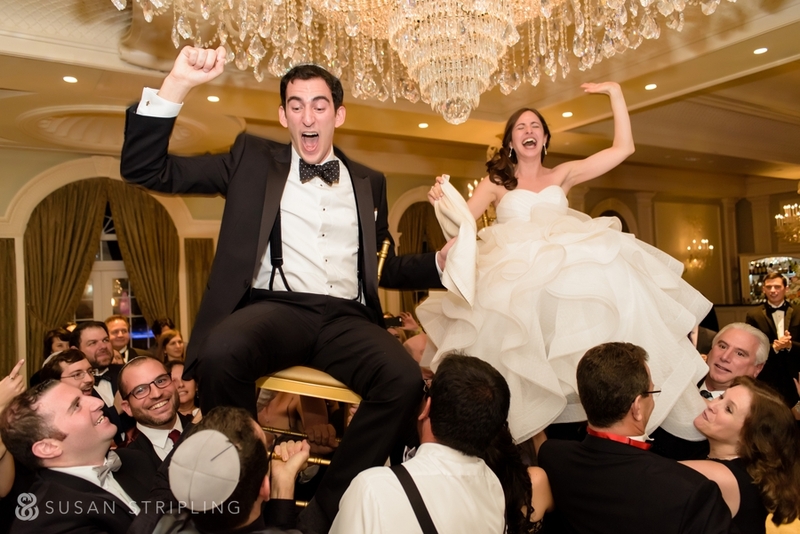 If you’re looking for great facial expressions on a wedding day, look no further than the hora at a Jewish wedding! I love everything about this image, from the drama of her skirt to the sweetness of her expression.